Puppies, originally uploaded by in2jazz. 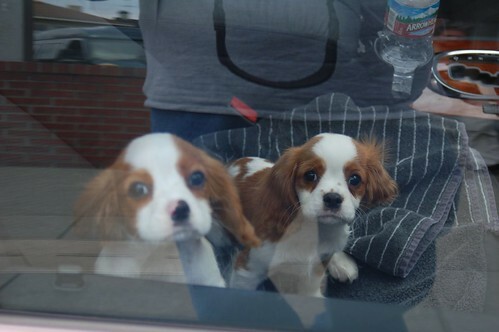 These two very happy puppies were sitting in the front seat of a car while I was out walking. I looked in at them and they jumped up to greet me. The sunroof was cracked so they were getting air. They were very adorable. Preparing the lattice, originally uploaded by in2jazz. This photo was from my first night apprenticing at Bakesale Betty. My personal goal is to sharpen my baking skills. Also, this is a far cry from being a computer geek. It was a lot of work but very fun. More photos here. 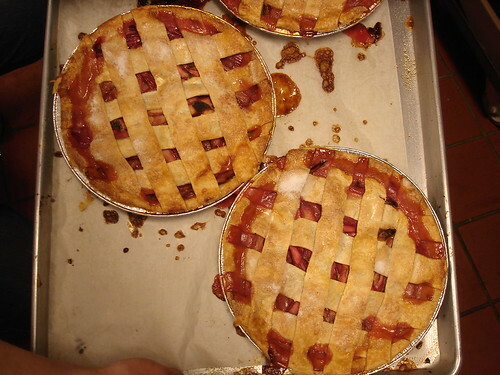 My task for the evening was prepping rhubarb pies. Betty started me out cutting out dough in circles and pressing it into the pie tins. Next, I prepared the rhubarb filling which consist of 25 pounds of rhubarbs, sugar, freshly squeezed orange juice, and orange zest. I mixed the rhubarb filling in a very large steel bowl with a large paddle which was like an oar. I rowed through the mixture and poured it into the pie shells. I took a dinner break and feasted on Betty’s pasta with portobello mushrooms (very yummy!) then she showed me how to make the lattice to cover the pies. I had never made a lattice before. It was much simpler than I expected but it took me a couple of pies to get the hang of cutting away the extra dough. 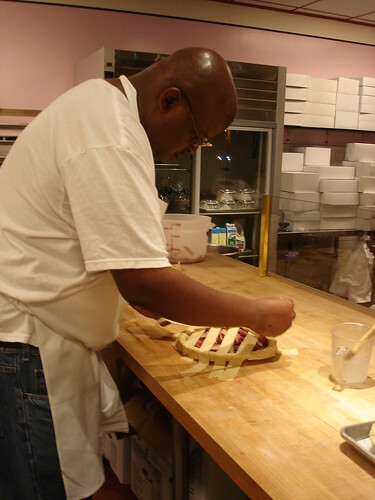 The final touch was brushing the lattice with cream and spreading sugar on the top of each pie. I loaded each cookie sheet of pies on the rack and placed the rack into oven. I prepped a total of 13 pies. I learned from Betty that it is not about speed but quality when baking. Betty gave me a couple of the pies I made and some other baked goodies to take to work with me. My co-workers loved everything and asked that I give Betty their thanks. Thank you to Betty and everyone at Bakesale Betty for a great experience. I definitely look forward to doing it again. You are currently viewing the archives for May, 2006 at Simply J Life.